I love the kind of lessons when you manage to successfully complete something you have always wished to try. I'm not talking about completing a grammar exercise or something likewise commonplace. I'm talking about methods, approaches and principles you strongly believe in, but which you somehow never have time (or the courage) to apply. For example, I always listen in awe to Jamie Keddie's talks about the power of storytelling and I'm also a fan of teaching with the use of realia. By realia I mean objects or activities used to relate classroom teaching to the real life. I believe that when these two methods merge in one, the lesson can become amazingly authentic and interesting. I should point out that although I love listening to people telling stories, I'm actually not exactly confident in telling stories myself - be it in my mother tongue or English. One of the reasons may be my deep-rooted conviction that I'm hopeless at storytelling, as well as telling jokes. Perhaps I also believe that nobody would be interested. Who cares about my life anyway? My students have better anecdotes to listen to. Well, the trouble is that once you start to believe something, it usually becomes part of your reality. It simply becomes the truth. So, perhaps, I'm a bad storyteller just because I'm convinced I'm a bad storyteller. Anyway, enough of self-flagellation. 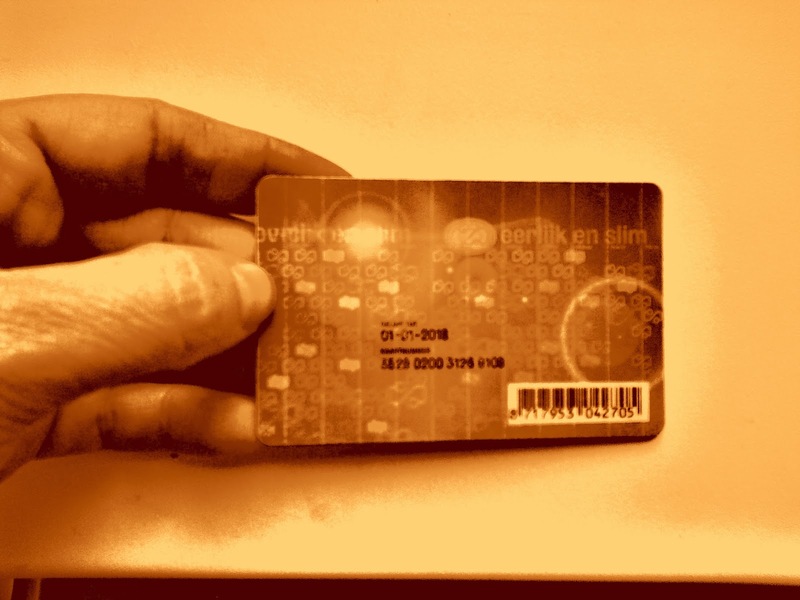 Earlier today, I stumbled upon a blue plastic card - the OV-chipkaart - which I had got hold of while on a short visit to the Netherlands. As soon as I came back to the Czech Republic, the card obviously became totally unusable, so this morning, I was about to dispose of it for good. But then I remembered the story behind the card and the unusual way I had obtained it, and I decided to keep it and exploit it in class. The story goes like this: As soon as I arrived at Eindhoven Airport, I needed to take a bus to get to the main station. While standing at the bus stop, desperately looking for some change for the ticket machine, a stranger (presumably an Englishman) approached me and said: "Here's a bus card. I thought it might come in handy. There's still some money left on it, but I'm leaving the country, so you can keep it." I was taken aback by his generosity and the fact that he knew what I was up to, so I stammered a few words of thanks and appreciation. Nevertheless, he was in a hurry to catch his plane and disappeared instantly. Since it was a very pleasant experience, I knew immediately that at some point I'd share the story with my students. However, I soon forgot about it and/or there wasn't an opportunity until earlier today. But as I know that I'm not a great raconteur, and the punchline of my story is always lost in translation, I decided to share it in a different way; I decided to turn the activity into a classic guessing game and leave some of the responsibility up to the students (cowardly me!). For starters, I gave away a small part of the story: Look at this card. I wanted to throw it away this morning, but I changed my mind because there is an interesting story behind it. I want you to find out how it came into my possession. The students were only allowed to ask yes/no questions to get to the true story, as close as possible. I did the activity in two classes (with pre-intermediate 16-year-olds and intermediate 18-year-olds) and the course of events was similar in both cases; at first the students were pretty confused by the aim of the activity and that's probably why they asked some totally ineffective questions. However, as they got closer to the denouement of the story, they became really interested. Their questions got more sophisticated, complex, as well as to the point. Needless to say, I was over the moon. You know, something strange happens when students get really involved in a speaking task; even the best learners start making quite a few errors, maybe because their excitement and the need to get their message across switch off their accuracy guard. They start messing up conditionals and all the tenses in a way they normally don't. Suddenly, they get all the prepositions wrong without even noticing. Although this is seemingly undesirable for a teacher to observe, for me it's a sign that my students are really communicating in the L2. This is one of the signs of the authenticity of a task. One thing is for sure; stories are powerful tools, no matter whether they are real or made up. If the story strikes a chord with us, it evokes imagination and incites curiosity. In addition and most importantly, in an L2 classroom, stories are likely to make the language more memorable.